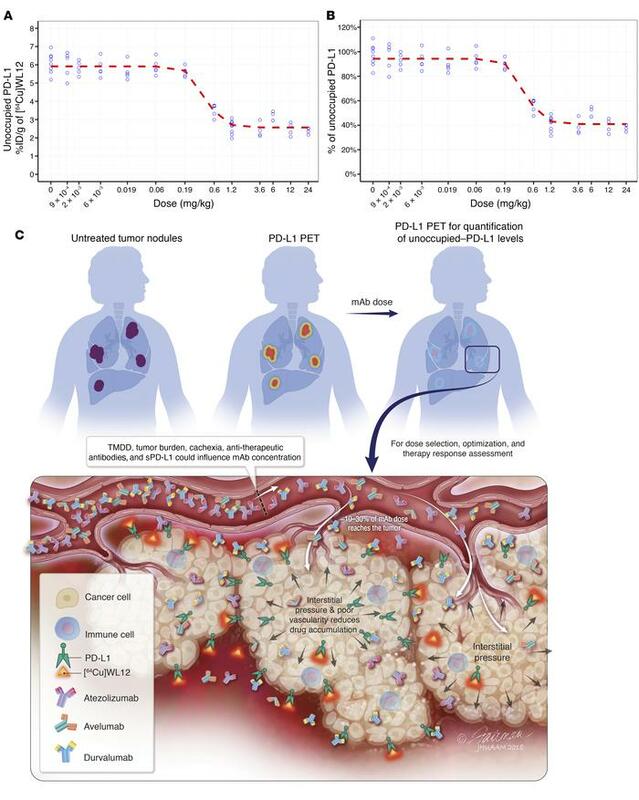 Effect of dose and time on tumor PD-L1 occupancy by AtzMab quantified using [64Cu]WL12. (A and B) Dose-exposure relationship depicting the decrease in unoccupied PD-L1, in MDAMB231 tumors in mice, with increase in AtzMab dose (mg/kg). Ex vivo quantification of [64Cu]WL12 uptake at 2 hours in tumors of mice treated with escalating doses of AtzMab (0.0009 to 24 mg/kg) (n = 3–9/group). AtzMab was injected 24 hours prior to radiotracer injection (A). Percentage of unoccupied PD-L1 was calculated relative to the median unoccupied PD-L1 measured at 0 mg/kg (B). Blue open dots: measured unoccupied PD-L1 for each dose level in mice. Red dashed line: mean model-predicted dose-response relationship. (C) Schematic of PD-L1 PET for PD-L1 therapeutic development and evaluation. sPD-L1, soluble PD-L1; TMDD, target-mediated drug disposition.